Respiratory Acidosis is a medical condition that occurs when the lungs can’t remove enough Carbon Dioxide (CO2) from the body, which causes the blood pH to decrease below 7.35. When too much CO2 stays in the blood, it causes a chain reaction that increases the amount of Hydrogen ions (H+) floating around. This increase in H+ is what makes the blood pH drop, which makes the bloodstream more acidic. Your blood can become acidic for other reasons, too. But when it becomes acidic because of the CO2 levels, that is what makes it Respiratory Acidosis. The primary way that our lungs get rid of CO2 is by exhaling. Therefore, we can deduce that the causes of Respiratory Acidosis HAVE to involve our lungs NOT exhaling enough CO2. We call this “retaining“ CO2 because our the CO2 is being retained in the body. Why do I explain this first? Because it’s better to understand the pathophysiology behind a condition, rather than simply memorizing a list of causes. You’re more likely to remember this way, AND you’re better able to critically think your way through test questions. That’s why I prefer to divide the causes of Respiratory Acidosis into related categories. Most often, especially for nursing school purposes, the reason that the lungs can’t exhale enough CO2 is due to a lung disease. The disease process could be infectious (i.e. pneumonia, bronchitis, RSV, etc), or non-infectious (i.e. COPD, emphysema, asthma, etc). For infectious causes, the illness symptoms can prevent O2/CO2 gas exchange from taking place at normal rates in the alveoli. This could be because of inflammation, or excess mucus blocking the gas exchange. For non-infectious causes of Respiratory Acidosis, there is usually a functional problem that makes the lungs less able to exhale CO2. For example, Chronic Obstructive Pulmonary Disorder (COPD) leads to scar tissue in the lungs, which makes the lungs less pliable (aka less able to stretch and move). When the lungs can’t move well, they can’t squeeze together to exhale as much CO2 as healthy lungs can. Certain medications can be causes of Respiratory Acidosis, too. This includes any substance having the potential to chemically suppress the respiratory rate or otherwise interfere with the brains ability to tell the lungs to breathe. A perfect example is morphine, an opioid which carries the risk of respiratory depression. If enough morphine is taken to suppress the patient’s breathing rate, then CO2 would be retained and Respiratory Acidosis could easily develop. Problems with the central and peripheral nervous systems are also potential causes of Respiratory Acidosis. For example, if a spinal cord injury or brain tumor slowed or stopped the signal from the brain telling the lungs to breath more frequently, then retained CO2 would result. Sometimes there can a physical obstruction that prevents the lungs from exhaling CO2. For example, a tumor that blocks one of the bronchi or bronchioles could physically prevent the lungs from expelling enough CO2. What are the different types of Respiratory Acidosis? Uncompensated Respiratory Acidosis is an acute condition that usually comes on suddenly and can be life threatening. Under normal circumstances, the kidneys help the lungs maintain correct blood pH by retaining or producing bicarbonate (HCO3–). However, because acute respiratory acidosis can develop so quickly, the kidneys don’t have enough time to respond and balance out the pH. The result is that there is too much CO2 in the blood, a normal amount of bicarbonate, and the blood pH dips below 7.35 to become more acidic. Fully Compensated Respiratory Acidosis is usually a chronic condition that comes on gradually. The slower pace of this imbalance allows time for the kidneys to retain (or produce) enough bicarbonate to accommodate any increases in CO2 and H+. Since the total bicarbonate level has time to increase and counterbalance the pH, the results are that there is too much CO2 AND bicarbonate in the blood, but the pH remains in the normal range of 7.35-7.45. The pH will lean towards the acidic side however, so you’re more likely to see a pH of 7.35-7.39. Partially Compensated Respiratory Acidosis is more of an “in-between” stage for when a patient is moving from Uncompensated Respiratory Acidosis into Fully Compensated Respiratory Acidosis. As the lungs are less able to get rid of CO2 and H+, the blood pH gradually decreases and becomes more acidic. At the same time, however, the the kidneys begin compensating by retaining or producing bicarbonate to balance out the pH. So you end up with too much CO2 AND too much bicarbonate, but the pH is still abnormal and in the acidic range (<7.35). What are signs of Respiratory Acidosis? Nursing textbooks (and professors) are great about listing LOTS of Respiratory Acidosis symptoms. The problem is, many of these signs and symptoms of Respiratory acidosis are rather generic, and could be true of many illnesses that are completely unrelated. Do you see how impossible it is to identify these generic Respiratory Acidosis symptoms? They also occur with just about every other illness you’ll study in nursing school. Which is why exams will always highlight the specific and unique symptoms…and you should focus on them when you study, too! What complication is associated with Respiratory Acidosis? It’s easy to think of symptoms and complications as separate things, but in reality they are a continuum. In nursing school we tend to identify complications as the more advanced and serious symptoms, or when a patient develops a separate disorder that was caused by the primary disorder (kind of like how left sided heart failure can cause right sided heart failure). With that in mind, one major complication of respiratory acidosis is hyperkalemia. This potentially severe complication occurs later in the disease process, after CO2 has increased so much that it starts trading places with K+ ions that would normally have stayed inside the body’s cells. This “trading places” is initially helpful because it decreases CO2 in the blood. 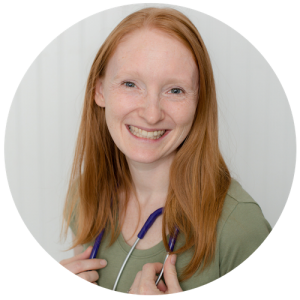 But if the root cause of Respiratory Acidosis is left uncorrected, then hyperkalemia can develop with all of the symptoms (and complications!) that go along with it. 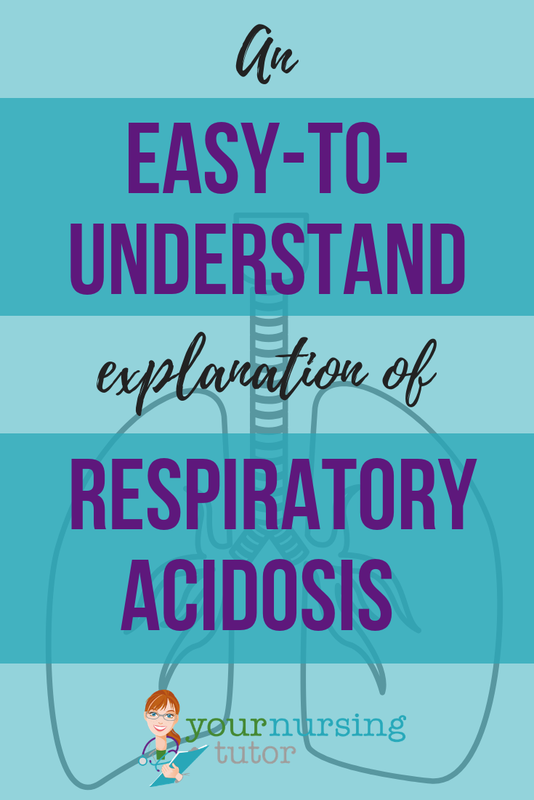 How is Respiratory Acidosis treated? Dyspnea is either an Airway or Breathing issue (remember your ABC’s? ), so it’s one of our priorities. If there’s a blockage, then your first concern is to maintain a patent airway. Also, since CO2 is increasing in the blood, then arterial 02 is likely to be decreased. This decrease in 02 may require that supplemental oxygen be administered. If Hyperkalemia is present, then it definitely needs to be addressed so that the patient doesn’t develop additional complications from that, such as dysrhythmias. There are many ways to handle Hyperkalemia, but when it occurs with Respiratory Acidosis then you may receive an order to administor Sodium Bicarbonate. Sodium Bicarbonate is a base that will help reduce the blood acidity by binding with some of the free H+. This causes the H+ that has already “traded places” with the K+ to trade back, thereby lowering levels of K+ in the blood. The original causes of Respiratory Acidosis will influence the Respiratory Acidosis treatment, too. For example, if it was caused by respiratory depression related to an opioid like morphine, then the treatment would obviously involve discontinuing the morphine and possibly administering an antidote such as naloxone (Narcan). If the cause was a lung infection such as bacterial pneumonia, then the Respiratory Acidosis treatment might involve administering an anabiotic. If the cause was viral pneumonia, however, then antibiotics would be inappropriate and only supportive measures might be used while the viral pneumonia runs its course. As you can see, there are at least as many possible Respiratory Acidosis treatments as there are possible causes. That is why knowing and understanding pathophysiology is so important! Like many diseases you study in nursing school, Respiratory Acidosis can be paired with and studied with an “opposite” disorder. In this case, the “opposite” disorder is Respiratory Alkalosis. Since everything is going in “opposite” directions with these two disorders, it is confusing to keep some things straight! Hyperventilation is one of the potentially confusing causes/symptoms. On the other hand, hyperventilation is a potential cause of respiratory alkalosis, which is characterized by low CO2 in the blood. Since hyperventilation can be very effective at “blowing off” CO2 from the body, it is also very effective at causing low bloodCO2. To summarize, hyperventilation is a symptom associated with Respiratory Acidosis, but hyperventilation is the main cause that can lead to Respiratory Alkalosis. 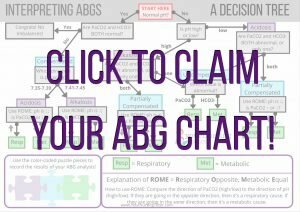 Sign up for a FREE ABG flowchart below to help you confidently identify Respiratory Acidosis!